We chose to build very complex tooling that allows us to build the Marlow Explorer with a minimum number of pieces. Our yacht is built primarily from three major molds rather than the standard 40-50 molds most yacht companies use. We feel with fewer seams our yachts will remain tight and leak free for decades to come. Our complex tooling produce beautifully finished hulls, superstructures and decks requiring a minimum amount of fairing and finishing. The portlights, windows, hatches and doors are all molded in to create smooth and finished openings for securely sealed installation of these components. Marlow Explorer Yachts are designed and built to cross the oceans of the world in comfort and safety while the proprietary Velocijet Strut Keel© technology allows inland and island cruising with fully protected running gear. In the Marlow Explorer, engineered tunnels accelerate and shape the propeller thrust for enhanced performance at all speeds. Directional stability is remarkably improved while significant drag reductions are accomplished. The advantages of the twin keels are many. In the Marlow Explorer, the shaft and bearings are enclosed inside a foil shaped Strut Keel, eliminating drag of the struts and protecting the vital running gear from logs, deadheads, trash and dirty water that otherwise flow through exposed struts and their bearings. The shape and design of the Strut Keels reshape the water as the boat passes through it. 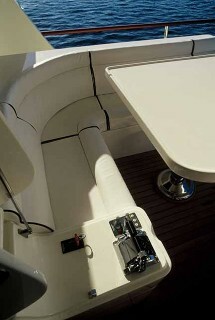 These changes to the shape of the water and waves will affect the performance of the boat by reducing the stern wave causing a noticeable increase in speed for a given throttle setting. The stabilizing action of the Velocijet Strut Keels© reduce greatly the plunging motion usually seen in most boats. These fins are effective at dampening rolling motion and this effect increases with speed. This reduction in pitch and roll enhances the ability of the Marlow Explorer to go to weather thus increasing the performance of the yacht, providing increased passenger comfort and decreased fuel usage. The Velocijet Strut Keels© ability to shape the water allows for reduced rudder size by shaping the water to meet the rudders. 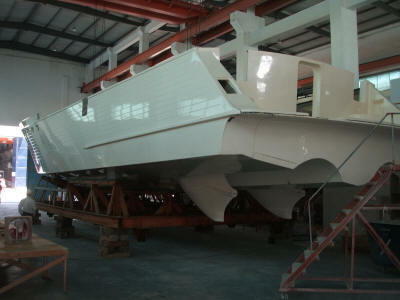 The reduced rudder size reduces power requirements and promotes better economy. 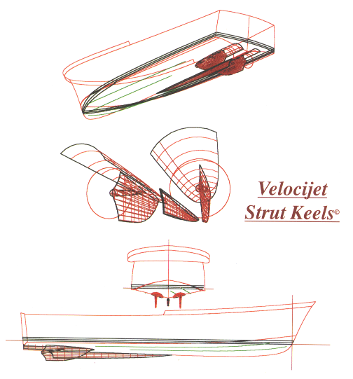 For a more in depth discussion of this Velocijet Strut Keel© technology click here. We have tried to think of and build in all the large and small features that make yachting such a pleasure. We have kept voluminous notes and records of the things that have aggravated and pleased us in over 40 years of voyaging on many of the oceans of the world. The end result is a world class line of yachts. The material components for the Marlow Explorer reads like a “who’s who” of quality manufacturing. Sub Zero, Caterpillar, Cummins, Northern Lights, Franke, Grohe, Ultraleather, Bosch, Asko, Opacmare, Cantaluppi, Besenzoni, Dacor, Vulcan and other top brands. The floors you walk on will not be plywood with a thin veneer, built in a production shop but rather solid premium hardwoods purchased, selected, sawn, dressed and built by our own craftsmen laminated to resin infused composite panels. Natural stones like granite and marble will grace these fine yachts.